My grandson recently turned 7 years old. For about 6 months before his birthday he reminded me frequently that he wanted the game Pop The Pig from Goliath Games . This is one of a couple games that are his very favorite and I was so happy when Goliath agreed to feature it on our blog with a review. 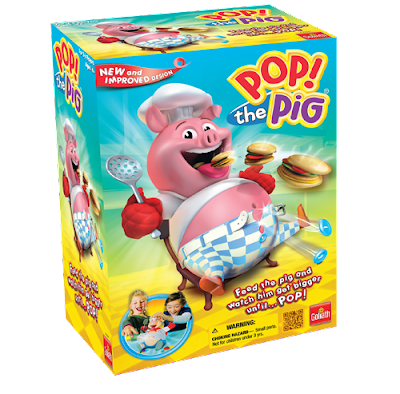 Pop The Pig is an international preschool classic that is adored by millions of children, it is the #2 best selling new kids game from the last five years. It is for 2-4 players ages 4 and up. To play, children will spin a spinner and pop hamburgers in the mouth of the pig and then pump his head. The more they pump his head the more the pigs belly will grow. Until pop. The kid who makes his belly pop loses the game. The game can then be easily reset with one pump of the pig's head. The kids love this game and the suspense of watching the pigs belly grow and burst is a thrill. This game provides children with hours of fun playtime. This game does not need any batteries to be played, which is great. All the pieces can be conveniently stored inside the pig. My grandson had a great birthday and he was beyond excited that he was able to add Pop The Pig to his game collection. Goliath is the go to place for high quality fun games for children and families at inexpensive prices. This one really sounds like a lot of fun with laughter and squeals as the pig's belly pops! !